Seoul (Agenzia Fides) – To establish relationships of trust and launch various projects and cooperation in various areas such as tourism, culture, religion, education, sport, art with exchanges among students, educators: with this purpose yesterday, 12 February a delegation of religious leaders, government officials and representatives of civil society associations crossed the border and reached North Korea for a joint event on the occasion of the New Year. The delegation, made up of about 250 South Koreans, arrived at Mount Geumgang on the east coast of the north for a two-day stay. 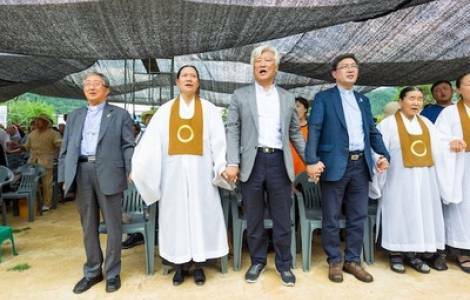 Leaders of the main religions of South Korea took part, as well as members of civil groups representing women, young people, agricultural communities, economy, environment, university, and peace movements. As confirmed to Fides sources in the Korean Church, among them was Archbishop Hyginus Kim Hee-joong, President of the Episcopal Conference of Korea, and other leaders engaged in inter-Korean reconciliation movements. As Agenzia Fides learns, this is the first cross-border event of 2019 and is the result of meetings between members of the Northern Government and the Korean Council for Reconciliation and Cooperation, active in the government of Seoul. As announced by the Ministry of Unification in Seoul, South Korea has approved more than a thousand requests of its citizens since mid-2017, giving permission to have contacts with North Korea, increasing cross-border contacts in the sports, cultural and religious sectors. Kim Hong-gul, at the head of the Korean Council for Reconciliation and Cooperation, stressed the importance of dialogue and cooperation in the process of rapprochement between the two nations. The Council aims to support the policy of involvement and reconciliation already started in 2000 by former President Kim Dae-jung.